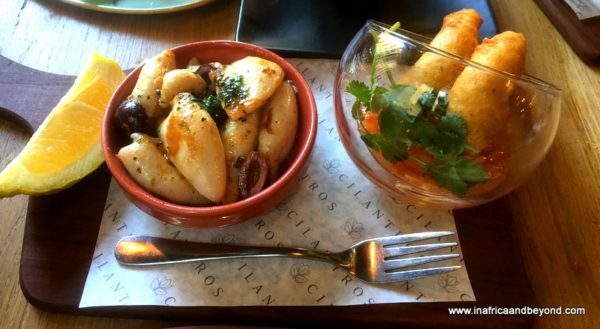 Tapas are not something I do often – mainly because the restaurants I tend to frequent don’t offer them. So when Zomato gave me a Cilantros voucher for being on their Blogger Leaderboard, I looked at the menu and decided that I definitely wanted to try the tapas out. The tantalising descriptions certainly helped with that decision. I made a telephonic reservation the day before – and received an SMS confirmation soon after. The following day, I received another SMS to re-confirm the booking. 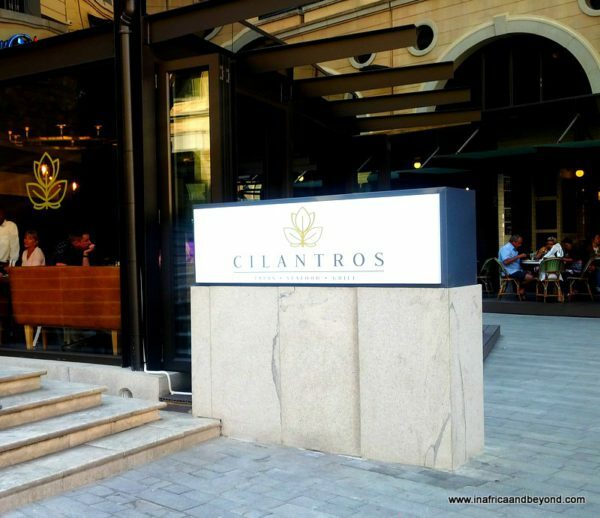 The restaurant is located on the vibrant Nelson Mandela Square next to Madibas statue. Although it has only been open for a few months, it is already considered one of the best restaurants on the Square. In case you’re wondering what the name means, Cilantro is a herb known as Coriander in Indian cooking. We went there on a Saturday afternoon with kids in tow. 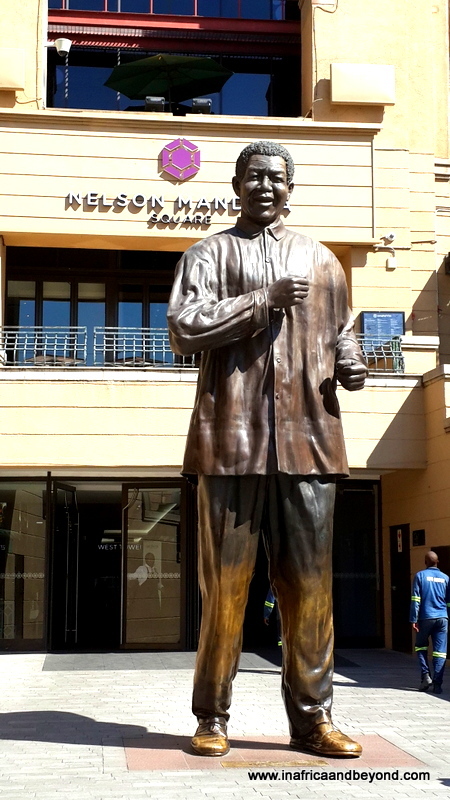 It has a great vibe, especially over the weekend, with children running through the fountains and people queuing up to take photos with the six- metre tall bronze sculpture of Madiba. We were greeted with huge smiles by Thandeka and Nicole, and seated in a jiffy. The décor is trendy and elegant and the indoor plants and winding vines added a natural outdoor element. 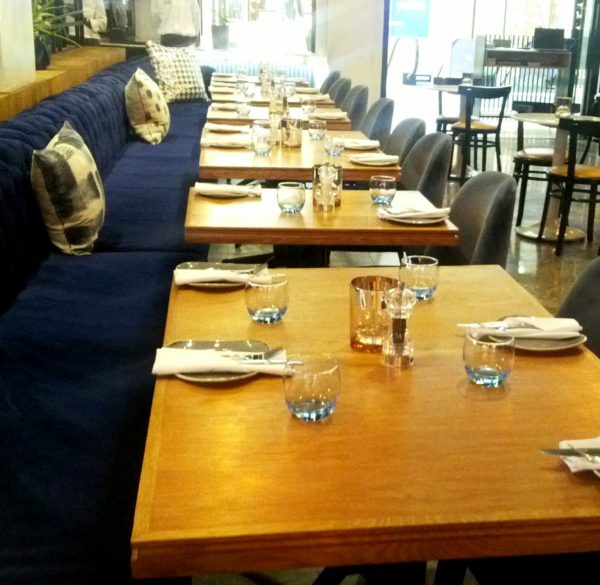 There are different seating options, depending on group sizes, including long velvet couches and smaller tables and chairs, making it suitable for business meetings, teambuilding lunches, intimate romantic meals and even family outings -as we discovered. After perusing the menu, we placed our order and were soon brought a board with fresh complimentary bread and butter. It was sundried-tomato flavoured and absolutely delicious. 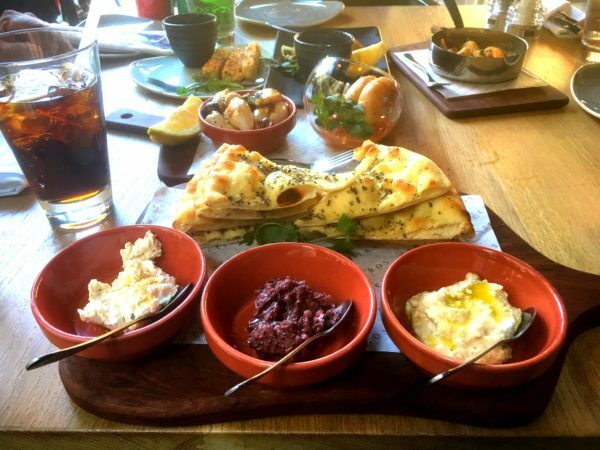 Focaccia Board – The toasted focaccia was served on a board with olive tapenade, hummus, marinated feta and an olive oil balsamic dip. Although we all enjoyed it, my son, who is a very picky eater, ate most of it. 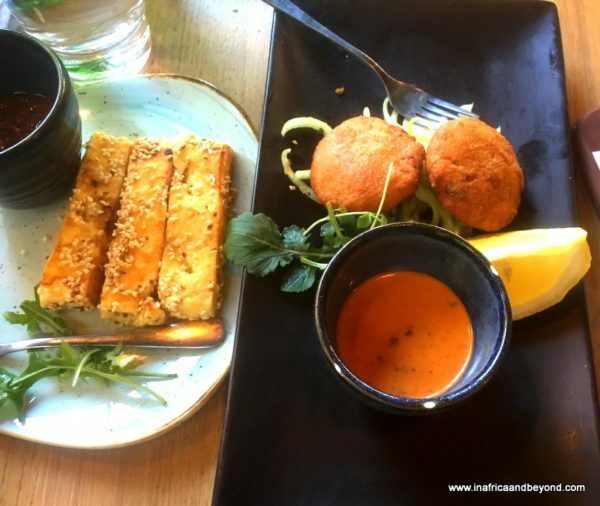 Halloumi Cheese – Grilled halloumi cheese covered in toasted sesame seeds and served with minted tomato relish. This was the first item to disappear from the table. It was perfectly grilled and the sesame seeds and relish enhanced the dish perfectly. Scottish Salmon Fishcakes -Salmon fishcakes served with fennel, rocket and a spicy Cilantros Dip. Oddly enough, we weren’t expecting much from this dish but probably enjoyed it the most. 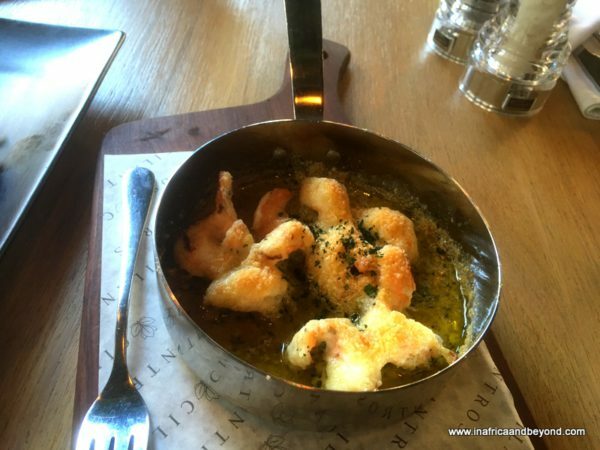 Garlic Butter Prawn Bites – Prawns served in a generous garlic butter sauce with Parmesan cheese. This was a flavour-packed dish but just as succulent as the other dishes. Tempura Prawns -Two tempura battered prawns served with a sweet chilli dip and garnished with cilantro. These were served in an attractive glass bowl and had just the right amount of crunch and flavour. They were also my daughter’s favourite dish. Calamari Lime – The pan-seared calamari was drizzled with lime juice and served with cilantro, olive oil, olive slices and garlic. Verdict: The spices and condiments complemented the dishes perfectly, the service was great, the presentation was beautiful and the food was delectable. I would definitely recommend this restaurant. For more information, go to Cilantros . Follow me on Zomato here. 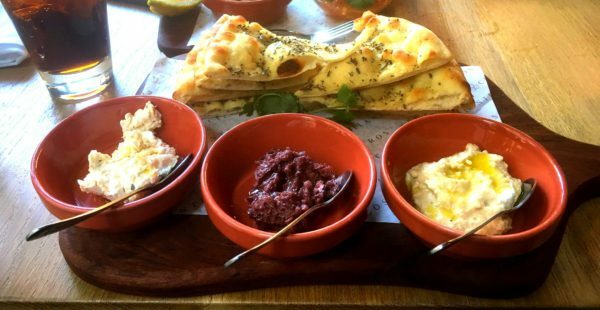 Read about the best halaal restaurants in Johannesburg here.